Gain new perspective with this intoxicating Indonesian island. Courtesy of Mandapa (Villa Path), Ritz Carlton (Pool). Courtesy of Brandon Presser. Whether it’s warranted or just a by-product of pop-culture buzz, Bali evokes a strong sense of place in our collective consciousness. The setting of Elizabeth Gilbert’s “Love” canto — immortalized in her best-selling Eat, Pray, Love — the island has long been revered for its transformative nature. Gilbert’s titular love was a coda detailing her blossoming romance with her future husband, which followed eight months of her nursing her wounds in India and Italy (she recently moved on to pursue a relationship with a woman). But for many, Bali is the first place people seek out, especially those wanting to unplug and gain a newfound trust in the universe. While it’s situated in a vast archipelago home to the world’s largest Muslim nation, the shimmering emerald island holds its Hindu roots dear and remains socially liberal by comparison. Its reputation as a destination of great healing began in ancient times; its locus, Ubud, is a derivation of the word obad, which means “medicine” in an old Balinese dialect. 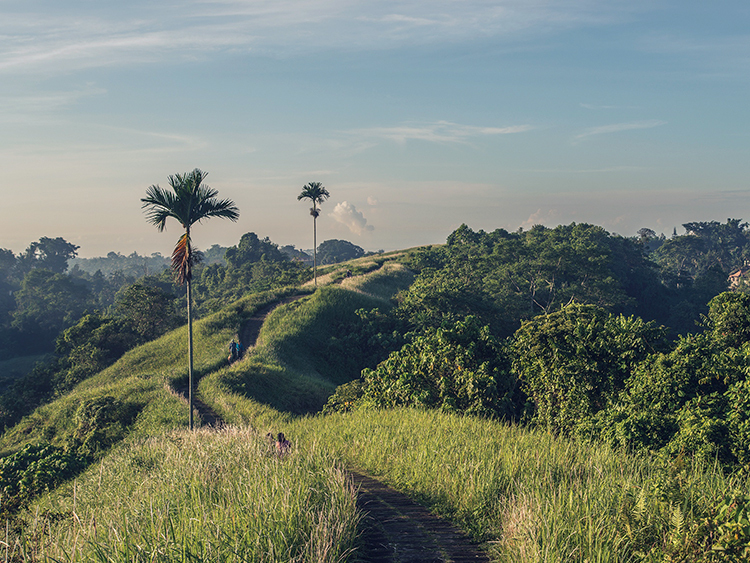 Ubud hides deep in the inland jungle, pulling travelers away from the island’s sandy beaches. Some come for the yoga and meditation; others are simply drawn in by its indescribable forces. Locals explain that Ubud sits atop a reservoir of incredible energy — one of the earth’s chakras — providing generations of practitioners with the cosmic tools to perform healing methods that defy Western medicine. Their connection to the land runs so deep that their powers are known to dwindle when they stray too far from the island. Over the past couple of decades, many resorts have sprung up along the churning jungle rivers serving as conduits between Ubud and its visitors, but none do it as adeptly as Mandapa, a Ritz-Carlton Reserve (RitzCarlton.com). Taking design cues from the traditional wooden towers and stone relics that dot the island, Mandapa’s suites have rolled every virtue of luxury into painstaking attempts at authentic Balinese style. The villas, deep in the valley below, come with private lap pools and beautiful murals depicting scenes from ancient holy texts. A stone path leads guests to the in-house spa — the heart of the resort. Each day, healers from the village gather there to perform sessions with the guests. Some, like Ketut Mursi, a blind healer who inherited her veritable sixth sense from her father’s father, perform energy manipulation and cleansing, while other practitioners put a Balinese twist on more commonplace treatments like massage. But the property’s dedication to local pursuits extends beyond the walls of the preserve. Guided sunrise market tours shine a fascinating light on homegrown produce and the conventions of the Indonesians’ dinner table, while visits to the ancient water temple are solemn reminders that, despite our globalizing world, the way of life in Ubud hasn’t wavered much from the time when Earth’s inhabitants lived in closer harmony with their planet. Top Left: Villa path; Mandapa. Top Right: A fish vendor at the fresh market in Ubud. Bottom Right: A stone deity at the Mandapa Spa. Bottom Left: The pool at Ritz-Carlton. 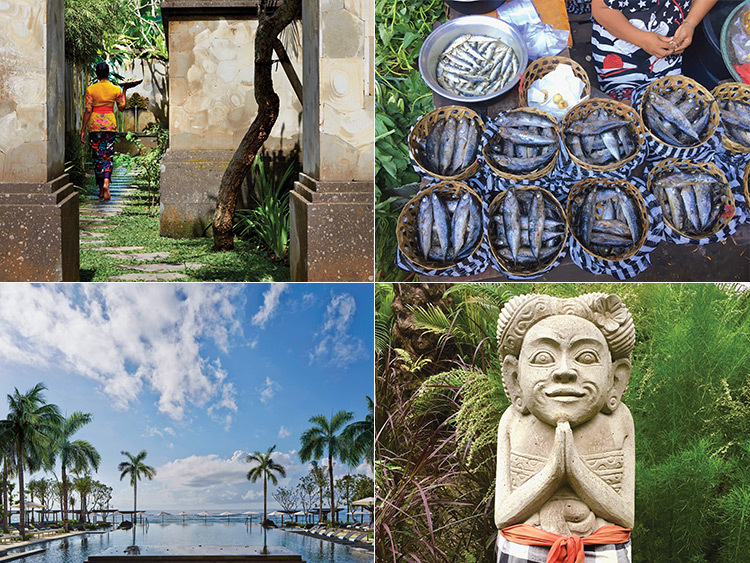 Beyond the mysticism of the jungle, Bali provides a more digestible dose of wellness: the beach. Mandapa’s sister property, Ritz-Carlton Bali, claims a massive oceanfront acreage in the purpose-built area of Nusa Dua along the island’s southern shores. Dedicated to the art of rest and relaxation, the resort takes all the tenets of a luxury beach holiday and dials them up a notch: dozens of swim-up suites, champagne brunches, expansive menus featuring everything from floppy-fresh sushi to Indonesian staples (don’t miss the soto pesmol sari laut, a creamy seafood soup), and a devoted events team that throws parties in the property’s stunning modernist chapel. And just when you’d pegged Bali as a could-be-anywhere paradise, a gentle prayer glides along the breeze at sunrise, the resort’s priest kneeling on the beach to perform a soul-purification ceremony for guests. A Hindu-Balinese tradition marking the beginning of a new journey, it’s the perfect send-off before you return to the grind you left behind. Only this time, you’ll be armed with a new perspective.